1. UNDERSTAND WHAT A CHAT BOT IS ? A CHAT BOT is a small automated system using very basic artificial intelligence to chat with a potential customer instantly at their convenience. They are great for engaging with a potential customer before they become a customer through social media platforms or through your website. Potential customers don’t want to commit straight away and can learn more from engaging with the bot. 2. WHERE ARE MY AUDIENCE CONNECTING WITH ME ONLINE? Where are you receiving the most enquiries? Choose the platform your potential customer is using the most. This is where you will Initiate your CHAT BOT. Speed to the lead after hours? Email opt in to learn more? Facebook ad re targeting/ engagement bot? There are many online companies that craft the bots using specifically designed software. Look for chat bot programs that offer technical and customer service support with their product. Check out ManaSocial and trial their Chat bot service. Write down a list of frequently asked questions potential and existing customers of your business ask? What content on your Social Media platform are your potential leads engaging with? What are the pain/ pleasure points of your target audience? Create a customer decision tree. Using this information to script a typical conversation which will lead your potential customers to the next buyer stage. Craft the best possible responses in your script. Humanise your bot! Give your bot a name! Think about the brand personality- this will help you decide what type of language to use for your bot. Do you use particular words or emoji’s in conversation? 7. 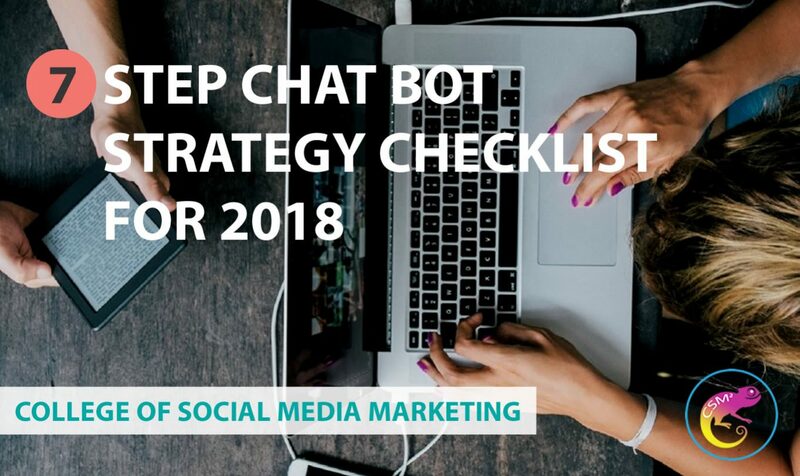 WORK OUT WHERE YOU WILL INTEGRATE THE CHAT BOT INTO YOUR SOCIAL MEDIA STRATEGY? Chat bots are great at every stage of the buyer process/ sales funnel. Consider which content on your social media will encourage potential clients to learn more about what you do! Integrate chat bot initiation from organic posts, Facebook, Instagram and messenger ads. TO REGISTER EMAIL OR CALL! YOU CAN DO TODAY TO KICKSTART YOUR SOCIAL MEDIA CAREER!